MY LIFE by Silke Ledlow: Flourishes Timeless Tuesday!!! How was your weekend??? Ours was uneventful and very relaxing...love those kinda days...LOL!!! How about playing along in our new Flourishes Timeless Tuesday Challenge ~ FTTC82??? It is the end of the month and we are happy to introduce you to our challenge host!!!! It is Traci Major and she is challenging us to a theme of *Summer Memories*!!! With summer quickly drawing to a close, Traci wants us to reflect on one of our summer activities and create a card capturing one of our favorite memories of Summer 2010! How fun it that??? Hope you will come and play with us :) !!! I immediately thought of our times at the beach!!! My girls and I just love to hang out and and enjoy every minute we have at the beach!!! If you are interested in some of our summer photos ~ click here. Of course I had to use the beautiful Flourishes Beach Life Set. Unfortunately my coloring skills are not good enough to capture the beauty of the ocean/beach!!! So I decided to participate in this weeks TPE82 ~ Mostly White Challenge....after all these images speak for themselves :). 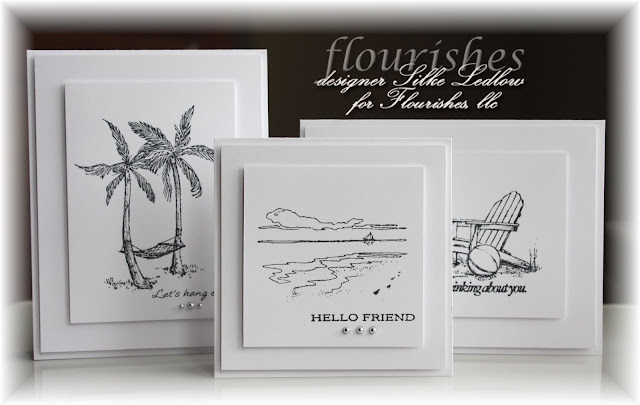 I matched the beach images up with several different Flourishes sentiments from the ~ Chairs for You, Friendly Reminders and Sweet Violets Sets. Of course I HAD to add some Silver Pearls for a little more pizazz :) !!! Now it's time to check out ~ Barbara, Betty, Cindy, Dee, Maki and Traci's take on the challenge!!! WOW-ers Girl these are GORGEOUS!! sehr, sehr schöne Karten, sie wirkens so herrlich edel und elegant, und die zauberhaften Motive kommen auf diese Art besonders gut zur Geltung. Maritime Motive mag ich ssssooo gerne. Wow, your card are so simple, but sooooooooooo wonderful. I like it. No one can do a white card like you! This is such a beautiful set of cards, wonderful! Fantastic way to use this set! Gorgeous cards! Hi, I'm lovin' these black and white cards! They are fresh and fabulous!!! Thanks for sharing! These are gorgeous Silke!! Love the black an white and the layers!! Silke, these are BEAUTIFUL! I love the black and white look! So clean and crisp! The white on white cardstock is awesome girl! Wow, Silke, I love this notecard set, so clean and crisp and the images are the main event...you aced this challenge, girl!! Thanks for sharing in my excitement this week by sharing your favorite memory!! Silke, these are awesome!! Simply fabulous!! Silke, this is simply and absolutely stunning!! What a fabulous set of summer cards! So pretty Silke! I swear you can make white paper sing like no other! This cards are all so amazing! I echo Mona's sentiments exactly! You are the master of white space! These cards are so elegant in their simplicity and just a touch of silver pearls! I totally agree with what Diane said...."refreshing". Love all the white! WOW! Are you the clever crafter! Gorgeous layered white designs, Silke! 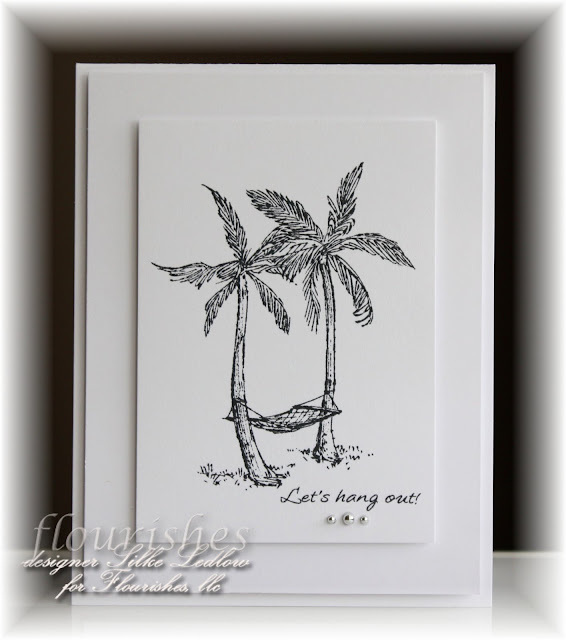 Amazing designs with just black ink, silver pearls, and white cardstock! Simply GORGEOUS! This is amazing. We are so coloring crazy we forget how beautiful these images are just as pen and ink sketches! Lovely and so elegant! Oh my goodness Silke!! CAS b/w never looked so good!! These are all over the top fabulous!! LOVE each one!! Silke, only you could make these look so gorgeous in black and white!!! Stunning my friend!! Wow! These are fantastic. I love the focal point on them. Your cards look so elegant too! Thanks for joining us at TPE! Oh. My. Goodness. I only have one word for these: awesome, just awesome. What a fabulous design idea, Silke! These cards are STUNNING!!! I'm going to pull out my old SU stamp set with the chair and CASE that one!!! Thanks!!! You truly are my favorite CAS card maker Silke, and this is why!! These are amazingly GORGEOUS! Oh these are just beautiful Silke!!! Absoulutely perfect for the challenge at TPE! Love your work! Unbelievable how fabulous this set looks without any coloring! Wow! You pulled this off beautifully, Silke! Oh my gosh, what beautiful simple elegant cards! LOVE THEM!